This is the official website for Hawkapella, the University of Hartford's all-male a cappella group. 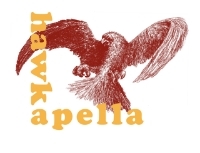 Click below to read about the founding of Hawkapella and learn about how we came to be the group we are today. Click below to see the faces of the Hawkamen, and their Hawkamom! Learn a little bit about their lives outside of the group. Click below to check out our most recent blog posts about our recent endeavors. For the most up-to-date information, stay glued to our Twitter and Facebook accounts!